The February issue of Bon Appetit couldn’t have been more timely. 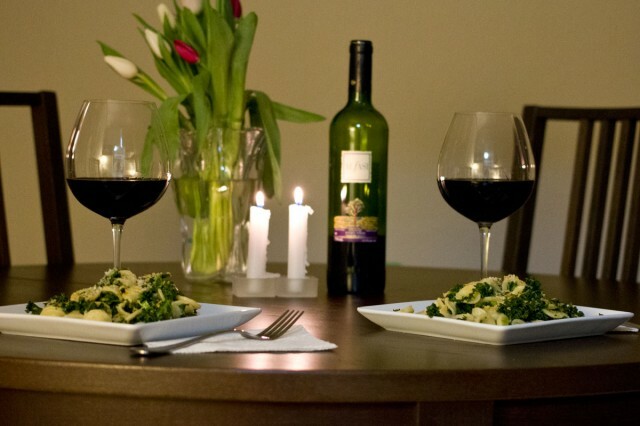 A feature on great pasta dishes just in time for Valentine’s Day? Perfect. 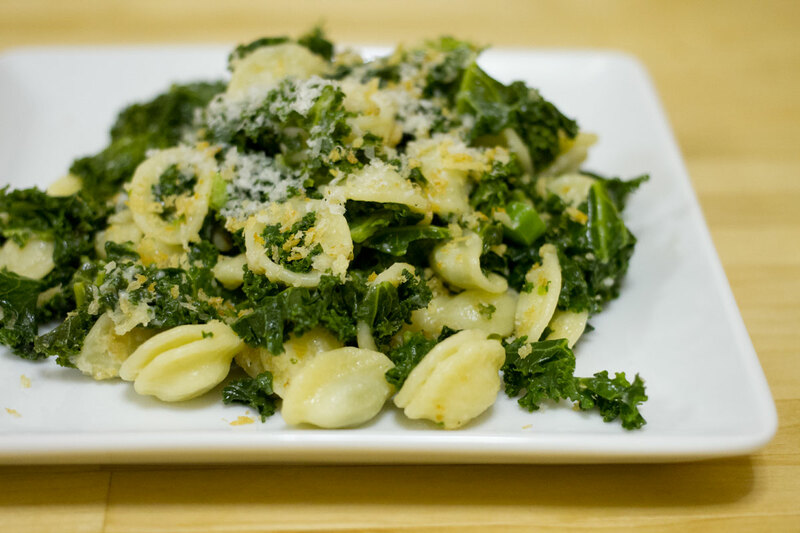 Of the seven delicious-sounding recipes in their feature, one caught both of our eyes for immediate consumption: the Orecchiette with Kale and Breadcrumbs. We planned it for our Valentine’s dinner at home, complete with flowers and candles on the table. And it was so delicious, we both went back for seconds . . . and thirds!! There’s a decent amount of prep (blanching kale, chopping it), but it is all completely worth it. If you’re on the fence about kale, this will win you over. Spinach wouldn’t be the same. Bring a large pot of salted water to a boil and blanch the kale, about 4 minutes at a time. Transfer to a rimmed baking sheet. When you’ve finished blanching, bring the pot of water back up to a boil. Squeeze as much water as you can out of the kale, then cut out the stem and finely dice the stems. Roughly chop the leaves. Heat 3 tablespoons of the oil in a small pan over medium heat. Add the breadcrumbs and stir to coat, then stir often until beginning to brown. Add one-third of the minced garlic and stir to distribute. Remove from heaat when the breadcrumbs are golden brown. Add salt and pepper and set aside to cool. Drop the pasta in the boiling kale water and cook until al dente. Meanwhile, heat butter and remaining 2 tablespoons olive oil in a large pot or pan over medium-low heat. Add the anchovies, red pepper flakes, and remanining garlic and cook, mashing anchovies until they are melted into the oil. Add the reserved kale and 1/2 cup of water and stir until the kale is covered with the sauce. Season with salt and pepper. Reserve 1 cup of the pasta liquid, then drain the pasta. Add it to the kale (or if your pan isn’t big enough like ours, return the pasta to the pot and then add the kale to it) and mix, adding half the reserved liquid and then more as needed to get a consistency you want. Add the Parmesan and half the breadcrumbs and stir to combine. Serve sprinkled with additional breadcrumbs and freshly grated Parmesan. This looks so amazing. I got my issue of BA and saw this. I will have to try it for sure. Prep time is almost always rewarded with a fab dish. i just bought kale too, but its for a kale&butternut squash lasagna.